What: A popular, diverse subculture within the Christian Church. Known primarily for its emphasis on the pursuit of health and wealth, both of which can be obtained through ‘positive confession’ and/or ‘acts of faith’ (such as donating money or throwing away medicines). Critics often refer to it as the health and wealth gospel, Name-it-and-claim-it (or, derogatorily, Blab-it-and-grab-it), Prosperity Teaching (or Prosperity Gospel). These labels tend to focus on just one or two aspects of Word-Faith theology. Membership: This worldwide movement does not have official, elected leaders, nor does it have offices, official publications or membership figures. Kenneth Hagin Ministries/Rhema Ministries based in Tulsa, Oklahoma, is considered to be the center of the movement, along with his Rhema Bible Training Center — the movement’s principal ministerial school. Key Proponents: John Avanzini, Paul (David) Yonggi Cho, Ken and Gloria Copeland, Kenneth W. Hagin (son of the late Kenneth Hagin), Marilyn Hickey, Benny Hinn, Joyce Meyer, Joel Osteen, Frederick Price, Robert Tilton, and many others. This movement’s doctrines range from aberrant to heretical, mixed with Biblical truth and generous helpings of nonsense. The movement is diverse, and does not have an official set of doctrines that must be adhered to. It follows that not all proponents and adherents teach, believe or practice each of the doctrines normally associated with Word-Faith theology. In addition, not all doctrines receive equal emphasis. Many Word-Faith doctrines lie at the basis of — or permeate — other erroneous teachings and movements, such as the New Apostolic Reformation or the so-called Prosperity Gospel. Some critics of the Word-of-Faith movement 6 say that Kenyon studied metaphysical New Thought teachings, as well as the theology of Christian Science — a cult of Christianity. They claim he combined mind science (where the term “name-it-and-claim-it” originated) with Pentecostalism — resulting in a curious blend of doctrines which were later adapted and popularized by Hagin. Others 7 insist that Kenyon was an aberrant teacher whose doctrines originated in the evangelical faith-cure movement of the nineteenth century. Doctrines: As noted, this is a widely diverse movement, that does not have an official leadership, denominational structure, or even an official body of doctrines. That said, at the root of Word-Faith theology is the belief that faith is a “force.” God spoke everything into existence. Before the fall, man had the same ability to speak things into existence. Sin separates man from God, but once a person has made peace with God by accepting the substitutionary atonement of Jesus Christ, he becomes not only a child of God but also incarnate — just as Jesus was and is: both God and man. Instead faith teachers insist you should either say something like, “headache be gone,” or start claiming (‘confessing’) that you already have received your healing — even while it may not yet be in evidence. 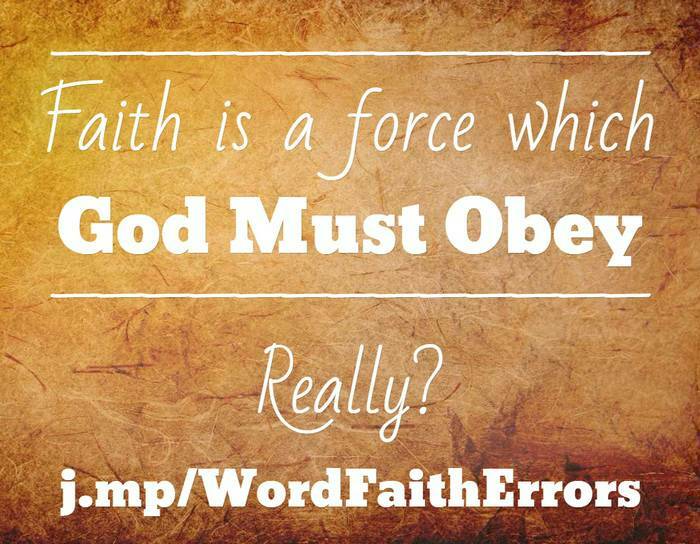 This means that God — whom faith teachers claim is himself bound by the laws of the ‘faith-force — must obey our words. A particularly pernicious teaching is that in order for God to be able to bless someone financially, that person must first demonstrate faith by giving donations (usually to those who preach this message). Another harmful teaching of the faith movement is that sickness usually (or always) is the result of sin and/or a lack of faith on the part of the person who is ill. Some Faith proponents claim that critics of the movement are modern-day Pharisees who oppose the movement of the Holy Spirit. Jesus died spiritually as well as physically, and was born again in hell before he rose from the death. This is a heretical doctrine. There are apostles and prophets today. While most Word-Faith teachers do not outright claim to have an authority that matches or supersedes that of Scripture, they do allege that God gives them direct revelation in the form of words of knowledge, prophecies, and visions. Proponents and followers tend to put personal revelation at least on a par with Scripture. God wants for Christians to be healthy and wealthy. Many Word-Faith teachers equate poverty with sin, including a lack of faith. Wealth, and health, needs to be “claimed” because Jesus through his atoning death has freed us from the curse of the law (Galatians 3:13), and we are now freed from all disease and poverty (Deuteronomy 28). There are many strong — and strongly-worded — opinions on this movement. Much of the criticism is based on the research of Daniel R. McConnell whose 1982 thesis, Kenyon Connection, was published as A Different Gospel (1988). According the McConnel, Kenyon got his doctrine from the metaphysical cults, Hagin plagiarized Kenyon and fathered the Faith movement. Written from a cessationist‘s point of view, John MacArthur’s book Charismatic Chaos, published in 1992, addresses all groups and doctrines which embrace the modern use of tongues, prophecy, signs and wonders, miracles, and faith healing. Word-Faith teachers owe their ancestry to groups like Christian Science, Swedenborgianism, Theosophy, Science of Mind, and New Thought–not to classical Pentecostalism. It reveals that at their very core, Word-Faith teachings are corrupt. Their undeniable derivation is cultish, not Christian. The sad truth is that the gospel proclaimed by the Word-Faith movement is not the gospel of the New Testament. Word-Faith doctrine is a mongrel system, a blend of mysticism, dualism, and gnosticism that borrows generously from the teachings of the metaphysical cults. The Word-Faith movement may be the most dangerous false system that has grown out of the charismatic movement so far, because so many charismatics are unsure of the finality of Scripture. Hank Hanegraaff, the controversial leader of the Christian Research Institute, reiterated much of McConnell’s thesis in his book Christianity In Crisis (1993) — “a landmark book … that confronts head-on a deadly cancer that is ravaging the body of Christ”. 12 While copiously annotated and documented, the book suffers from a sensationalistic tone. Three years later DeArteaga published a revised version of Quenching the Spirit that includes a response to Hanegraaff’s book. He acknowledges that there are some doctrinal problems in the Word-Faith movement, but just as in the earlier book he vilifies and condemns those who reject the movement and the “move of God” as Pharisees. • The distinctive theology of the Word-Faith movement is in many respects seriously unbiblical, and at least some of the movement’s leading teachers espouse heresy. This heresy, however, is not accurately described in the literature critical of the Word-Faith movement. • Sweeping generalizations about the Word-Faith movement as cultic or heretical fail to take sufficient stock of the diversity within the movement. • The Word-Faith teachers’ views on healing and prosperity are actually the least problematic aspects of their distinct theology. In significant ways their views, while troublesome, are more moderate than those of their predecessors in the faith-cure and early Pentecostal traditions. • The popular characterization of the Word-Faith teaching as a “gospel of greed” hawked by religious con artists is generally an unfair caricature applying only to certain teachers on the fringe of the movement. • While the errors of the Word-Faith movement are largely rooted in problematic elements of the Pentecostal tradition, a theologically sound form of Pentecostalism has emerged that rises above those weaknesses. Bowman documents that the faith movement presents greater complexity than most of its critics acknowledge. Instead I found myself giving the rather inelegant answer that the Word-Faith movement was a mess. It is, I explained, neither soundly orthodox not thoroughly heretical. It could not be categorized without qualification as either Christian or cultic. 13 Some of the leaders did teach some heretical ideas, but none of them seemed to advocate those heretical ideas consistently, and most people in the movement did not embrace those heresies. Unlike many Word-Faith critics Bowman does not stereotype and attack the movement based on the most outlandish teachings of it’s most radical proponents — pointing out that many Word-Faith believers themselves also reject such off-the-wall teachings. Instead he looks at the movement as a whole. He first traces the roots of the faith movement, documenting why Kenyon’s theology was not simply recycling New Thought, “a ‘baptized’ version of metaphysics,” as McConnell put it. He then shows that real roots of Kenyon was instead influenced mostly by evangelical faith-cure and early Pentecostal movements. The final two-thirds of the book consists of a point-by-point examination of the Word-Faith movement’s most prominent teachings. Finally, … the Word-Faith teaching is demonstrably detrimental to a sound Christian life, though in varying degrees. The movement as a whole is suborthodox and aberrant. By suborthodox I mean that the teaching in certain crucial respects falls below the standards of orthodoxy. By aberrant I mean that its teaching in other respects deviate from orthodoxy in ways difficult to classify easily,. The doctrine that God has a spirit body is an example of a suborthodox views. The doctrine that full healing is guaranteeed in this life in the atonement I would classify as aberrant. Some of the teachers in the movement, as well as on its fringes, are clearly teaching heresy. This would be my assessment of the theologies of Kenneth Copeland, Charles Capps, and Earl Paulk (the last of whom is on the fringes of the movement). Many of the Christians who participate in the movement are orthodox, if theologically uninformed. My own experience of talking to people in the Word-Faith movement is that many, if not most, of them do not believe heretical and near-heretical ideas espoused by the leaders. For example, I have yet to meet a member of a Word-Faith church, or a devotee of a particular Word-Faith teacher, who agreed with Copeland’s view of Jesus have having been positively confessed into existence. Typically such persons find it difficult to accept that their favorite teacher espouses such views. The Word-Faith movement should not be described as cultic. As bad as some of the teaching is in the Word-Faith movement, this movement simply does not belong in the category of cults 17 along with the Jehovah’s Witnesses, Mormons, and Christian Science. When heretics are found within a Christian tradition it is not correct to label the whole tradition or movement cultic. For example, in my estimation the ultraliberal Episcopal bishop John Shelby Spong is an outright heretic, but that does not make the Episcopal church (which regrettably tolerates him) a cult. ‘Apologetics’ is the branch of Christian theology concerned with the intelligent presentation and defense of the historical Christian faith. – Source: 1 Peter 3:15-16, NIV, Emphasis ours. But regardless of who we interact with — Christians or non-Christians — we must engage them with gentleness and respect. This Biblical command is often ignored by those who address the erroneous beliefs of Word-of-Faith proponents. You don’t have to search long in, say, YouTube to find examples of Christians trying to confront false teachings with and attitude of rudeness and ridicule. It is good to be clear, honest and straight-forward in addressing errors and communicating truth. But if we do so without love — which results in gentleness and respect — we are not doing ourselves nor our audience any favors. Christians who wish to help others understand and repent from the errors of the Faith message would do well to read 1 Corinthians 13 — and to act accordingly. This video, produced by Keith Thompson of Reformed Apologetics Ministries documents the errors and origins of Word-Faith teachings. Includes many examples quoted from the movement’s leading proponents. (Note that Thompson does at the end recount McConnell’s views regarding the movement’s origins). For material dealing largely with individual preachers within this movement see our topical index. A critical look at the ‘Word of Faith’ teachings Published by Ministry Watch, a ministry that educates donors to make informed, discerning decisions in deciding which organizations and teachers to support financially. Says that many of the Word-Faith Ministries are “Legally organized as a church in order to avoid financial disclosures; however, it is not what would commonly be known as a traditional congregational church.” Many of the organizations are tightly controlled by a few people — often family members. Ministry Watch says “these Word of Faith ministries are also characterized by a lack of financial accountability and transparency in financial dealings,” and therefore get a “F” Transparency Grade. An examination of the Word-Faith movement by Richard J. Vincent. This ‘text file’ has been around for a long time — dating back to the pre-WorldWideWeb time of Bulletin Board Systems (BBS). It addresses some teachings by Kenneth Copeland, Benny Hinn and John Avanzini, referencing television broadcasts and cassette tapes. Heresies of the Word Faith Movement A limited collection of quotes by faith teachers Joyce Meyer, Kenneth Hagin, Kenneth Copeland, Benny Hinn, Fred Price, Paul Crouch, Kathryn Kuhlman, and Marilyn Hickey — along with Biblical responses. Heresies of the Word-Faith Movement (Different from the listing above this one). The text can be found on many websites, but the link leads to a January, 1998 capture by the Internet Archive. It may have first been published a few years before that. I do believe the publisher, then known as the Christian Youth Alliance, was the originator of this file. It consists of quotes by, for the most part, Benny Hinn, Morris Cerullo, Kenneth Copeland and John and Paul Crouch – documenting the errors of their teachings. Positive Confession Watchman Fellowship looks at this aspect of Word-Faith theology: the notion that if a believer speaks “spiritual” or “faith-filled” words then he can have what he says. What’s wrong with the Word-Faith Movement? (+ part 2) by Hank Hanegraaff. A helpful overview that first appeared in the Christian Research Journal, volume 15, number 4 (1993). Christianity In Crisis: The 21st Century by Hank Hanegraaff, the controversial president of the Christian Research Institute. A Different Gospel: Updated Edition A classic on the subject, by Dan R. McConnell who, among things, warns of the movement’s cultic nature in its doctrine of healing and its understanding of the atonement, and demonstrates how far the movement’s doctrine of prosperity is from Scripture’s true teaching. The Facts on the Faith Movement by John Ankerberg and John Weldon. Available in Kindle format only. The Word-Faith Controversy: Understanding the Health and Wealth Gospel by Robert M. Bowman Jr.. An excellent book in typical Robert Bowman style: a balanced approach that includes documented facts, well-reasoned opinions, and a logical presentation that helps the reader to grasp the complex nature of this diverse movement. Highly recommended. Spiritual Shipwreck of the Word Faith Movement Presentation by Justin Peters, who among other things addresses some popular ‘Christian’ books that include lots of non-Christian material. Walter Martin on the Word-Faith Movement Not a video, but an audio file by Walter Martin, author of The Kingdom of the Cults. Word of Faith Teachers: Origins & Errors of Their Teaching A 3-hour video by Keith Thompson, of Reformed Apologetics Ministries, This excellent presentation covers the following issues: Are we little gods?, Preaching a Different Jesus, Declaring Health, Wealth, and Happines, and Questionable Origins of the Movement. A DVD of the video can be purchased for a donation at Keith’s website. The Word of Faith Movement entry was written by Anton Hein, founder and team member of Apologetics Index. He and his wife, Janet, live and work in Amsterdam, Netherlands. Anton builds and maintains websites, while Janet — a licensed mental health counselor — works with an organization that provides counseling, shelter, legal- and other practical help to abused women and men. Their Christian ministry is based on their understanding of grace and mercy. When he isn’t tinkering with websites, cooking something spicy, or reading anything and everything, Anton — who enjoys street photography — can be found wandering the streets of Amsterdam (and, er, researching quality coffee houses).